The videos on this site were recorded by Satellite Spies in New Zealand between 1985 and 1989. You will not find these videos on YouTube, due to copyright/trademark complaints by Deane Sutherland and his company S.E.R.L Science Trustee Ltd. The complaints to YouTube were invalid and this is confirmed by leading New Zealand Intellectual Property lawyer Wayne Hudson in his letter dated 9th July 2009 to Mark Loveys. It is understandable that YouTube cannot be expected to research the correctness of every legal complaint they receive and given that they do not make much (if any) revenue hosting these old videos, we can't blame them for simply switching the videos off, rather than take any perceived legal risk. 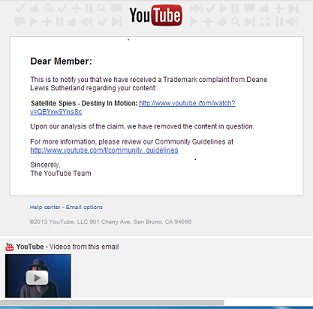 As for the motivation of Deane Sutherland in getting the videos removed from YouTube; we can only guess. He left the band in 1986 immediately after the band's Dire Straits support tour and reappeared years later, setting up another band with the same name in the 1990's. Videos to the songs Private Detective, Only Here for the Rock n Roll and Gonna Have to Change were all recorded after Sutherland left the band.